For something that was once a fairly revolutionary addition to the media landscape — imagine, a way to add your comment to a story without having to write and mail a letter to the editor! — comments have since become the red-headed stepchild of the internet. Although there are some interesting experiments at work to reinvent them, they are mostly reviled, unloved, ghetto-ized and in many cases shut off altogether or handed over to Facebook to manage. Will the addition of sponsored comments somehow improve this state of affairs? It’s difficult to see how, but that’s what Disqus is introducing: as the largest comment-hosting platform (next to Facebook, that is) the company’s software powers the comment sections at sites like ABC News and The Atlantic. 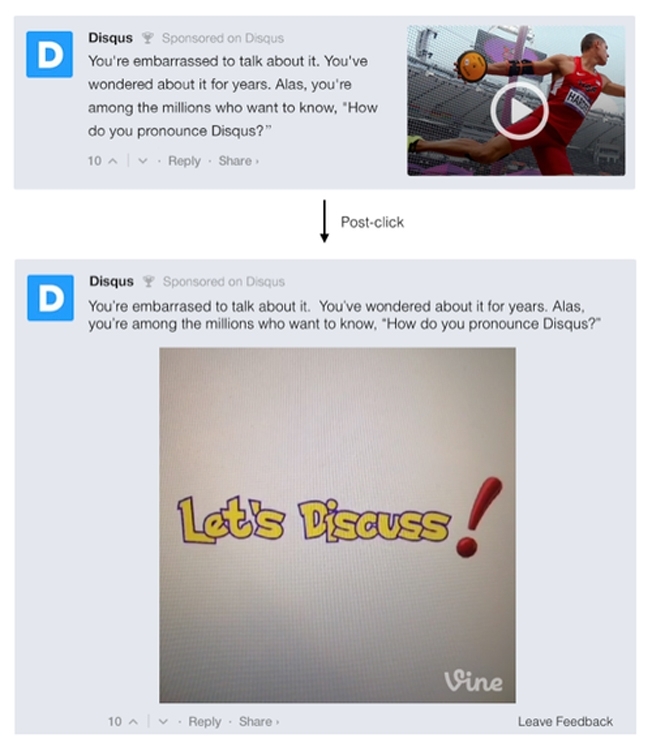 According to Ad Week magazine, Disqus is launching its sponsored comment feature, which allows advertisers to target specific comment threads on specific articles with an ad that looks like a comment, and is placed at the top of the comment section. When clicked, it reveals an ad placement not unlike what Twitter offers with its embedded ads and images. Publishers can choose whether to enable the feature or not, and share in the revenue. Obviously, Disqus needs to generate revenue somehow from its commenting platform, and sponsored content seems to be the ad industry’s latest obsession — mostly because traditional banner advertising is becoming increasingly useless. And some publishers will no doubt also be desperate enough for revenue to turn on the feature in the hope that they will get something from nothing. For readers, however, sponsored comments are likely to make comment sections an even less appealing place — if such a thing is even possible. And that’s a shame, because there is value in hearing from your readers, even if many media companies don’t spend a lot of time doing it. Comments get criticized for being cesspools of bile and a haven for trolls — there’s even a Twitter account that spends its time trying to convince people not to read the comments — but at the same time they can generate thoughtful discussions when done well. Atlantic writer Ta-Nehisi Coates thanked his commenters recently for helping him win a National Magazine award, and both the Atlantic and Gawker have found writers in their comment sections. As veteran blogger and ThinkUp co-founder Anil Dash has pointed out before, if your comment section is full of trolls, it’s mostly your fault for not creating a more positive community, by engaging in the comments (and that means weeding out trolls). Whether sponsored comments helps achieve that goal remains to be seen, but I have to say I’m not optimistic. So, Disqus provides the commenting sections for FREE?? I can think of a way that they could generate some income that does NOT involve ads. I don’t know why more sites don’t use G+ for commenting. It works very well and is great for having an actual discussion. I made over $6,000 last month napping on my sofa. Feel free to connect to me to learn how! It’s Disqus-ting if you ask me. Just trolling. I could, perhaps, deal with sponsored content in a comments section, if it was clearly identified. If the intent is to make it seem like just another comment, but designed to get you to click on a product link, I would find that to be deceptive and insulting. GigaOm strikes a pretty good compromise on sponsored content currently. It’s clearly marked and sometimes does provide relevant information to me.